These traditional sloe gin recipes come from my grandfather’s wine recipes book. His notes were often short as they were aids for him rather than meant for publication so I’ve expanded and clarified them to make things easier for beginners. Sloes are the fruits of the blackthorn tree. They’re related to damsons and plums but they’re very different in flavour. Sloes are very bitter and sharp – not a fruit you can eat off the tree! They do sweeten somewhat after they’ve been frosted. 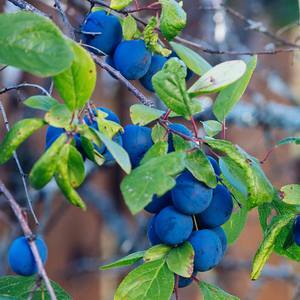 Sloes are more a large berry, the large ones being just half an inch in diameter. The biggest difficulty with sloes is picking them. The blackthorn, as the name suggests, has a very dark bark and really nasty spines. The spines go right through gloves so it’s just a matter of being very, very careful. If you do get the thorns in you, take care how you pull them out. They have a nasty habit of the tip breaking off and remaining under the skin where they fester. Like a splinter, it’s a needle and tweezers job to get them out. They do make a decent jam and a wine as well as sloe gin or vodka. It’s important to harvest them when they are ripe. They start off green but turn a deep blue to black colour when ready to pick in October or November. For both recipes a large Kilner jar is ideal but some of the best sloe gin I tested was made in a washed-out lemonade bottle with a screw-top! This recipe calls for bitter almonds which are very difficult to obtain but you can substitute a flavouring. The reason they’re so difficult to obtain is that they’re very poisonous. They contain a chemical that turns into cyanide and 50 bitter almonds will kill most adults and as few as 5 could kill a child. However, they do have a distinctive flavour. Clean and prick the sloes a couple of times each with a wooden toothpick or cocktail stick. There’s a tradition that you shouldn’t use a metal fork or needle for this. Put them into the jar with the sugar and almonds and pour in the gin. Seal the jar and place in a dark place, not too cold or hot. We keep it in a Welsh dresser in the living room. Initially give the jar a shake a couple of times a day for the first week, thereafter each week or more often if you remember. After 3 months, strain through muslin and bottle, sealing the corks. The gin can be drunk immediately. It can be kept for years and the flavour will improve greatly for the keeping. As for the first slow gin recipe. Oh, and forget the almonds! Keep in a dark cupboard & shake bottles regularly over 2-3 months. Strain through muslin into clear, clean screw-capped wine bottles (or similar tall clear bottles). Leave in a cool place for a few weeks, then decant into a decent decanter carefully (as the original straining NEVER removes all the sloe particles). Enjoy!